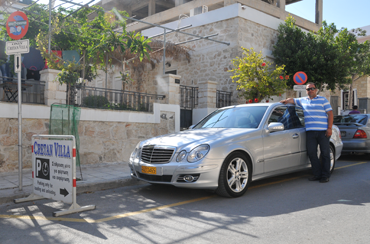 Cretan Villa Hotel Ierapetra: airport taxi transfer from Heraklion, Chania. If you like to book a taxi to collect you from Heraklion airport or port, we can send one (100 km 100,00 euro). This offer is valid only for direct reservations from our official web sites. Your driver will be waiting for you at the arrivals with a sign stating your name. You will be escorted to your vehicle and transferred directly to our door.